Child undernutrition and flooding are highly prevalent public health issues in Asia, yet epidemiological studies investigating this association are lacking. In the last decade alone, floods have affected nearly one billion people worldwide. Despite their potential burden to society, the consequences of floods on human health remain rarely investigated. Our understanding of the long-term health consequences of flooding and recurrent floods is particularly limited. 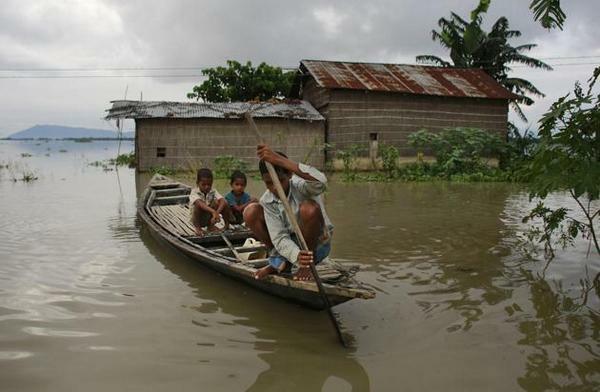 Floods can severely disrupt livelihoods, especially in low-resource settings. Flooded households are affected by a plethora of adverse conditions including food insecurity due to crop failure or food affordability due to sudden price changes. Daily care of children and breastfeeding practices is importantly challenged during floods as in worst scenarios all basic services become disrupted, including water and sanitation conditions, or the provision of community basic health and social services. In addition, diarrhea or respiratory diseases, which occur at increased rates during or after flooding have the potential to worsen child nutritional status. Children’s higher susceptibility to climate-related hazards, coupled with climate-related food insecurity in many developing economies, might increase the burden of disease due to flooding, jeopardizing the human development of future generations. Despite this, sound evidence on the association of flooding and child nutrition is still rare and population-based studies are lacking. The consequences of floods on the nutritional health of the most vulnerable has long been stated. However, far-reaching change on both tailored prevention and response policies will require sound scientific evidence. In this article* we sought to examine the association between flooding and child undernutrition in an epidemiological, controlled rural population-based study representative of 17,876 children aged 6 to 59 months conducted in September 2009. We assessed children affected solely by the 2008 flood and by repeated flooding in 2006 and 2008 and investigated the most vulnerable child cohorts through the interaction of flood exposure with child’s age. *download from right-hand column or via links under further resources. The key points from the article are provided below. See the full text for much more detail. To investigate to what extent floods exacerbate poor nutritional status in children and identify most vulnerable groups, we conducted a population-based survey of children aged 6–59 months inhabiting flooded and non-flooded communities of the Jagatsinghpur district, Odisha (India), one year after large floods in 2008. Anthropometric measurements on 879 children and child, parental and household level variables were collected through face-to-face interviews in September 2009. The association between flooding and the prevalence of wasting, stunting and underweight was examined using weighted multivariate logistic regression for children inhabiting communities exposed solely to floods in 2008 and those communities repeatedly flooded (2006 and 2008) controlling for parental education and other relevant variables. We examined the influence of age on this association. Propensity score matching was conducted to test the robustness of our findings. In the Indian communities studied, flood-related undernutition persisted well beyond the typical period of emergency relief. In our specific setting, wasting was more prominent than underweight or stunting, indicating the nutritional stresses experienced by the affected child populations. In addition, we found that not only is the burden of undernutrition greater among the flood-affected children and particularly among infants, but the severity of this condition is significantly higher in children inhabiting villages that are repeatedly flooded. Climate change is likely to increase flooding in some regions, both in frequency and severity. This will further aggravate this situation, particularly in low-resource settings or rural populations where susbsistence farming is very common. In these contexts, we recommend the following actions. Protracted nutritional response after floods should be seriously considered to counteract the long-term nutritional effects on children. In areas where flooding is a recurrent occurrence, policies for relief should be reviewed to ensure a longer period of support and proper take up by development programs. Particular attention should be paid to the nutritional health of mothers as the effects are worst amongst infants. Most importantly, preventive action should be put in place to protect mothers and children in flood prone areas. Systematic and long-lasting monitoring of the nutritional status of vulnerable groups in the aftermath of floods (but also pre-flood if possible) might be helpful to tailor the response and food supply in each particular context. Further stringent epidemiological studies that bring evidence on floods and nutrition to inform public health policies within the climate change framework are urgently required. Particularly in low-resource or subsistence-farming rural settings, long-lasting nutritional response in the aftermath of floods should be seriously considered to counteract the long-term nutritional effects on children, particularly infants, and include their mothers on whom they are dependent. The systematic monitoring of nutritional status in these groups might help to tailor efficient responses in each particular context. Rodriguez-Llanes, J.M., Ranjan-Dash, S., Mukhopadhyay, A. and Guha-Sapir, D. (2016) Flood-Exposure is Associated with Higher Prevalence of Child Undernutrition in Rural Eastern India. Int. J. Environ. Res. Public Health 13(2).